Presently, with the exception of Hachimangū in Aza Kobayashi, there is no other shrine in the Tako area which leads us to assume that Hachimangū was in fact, originally, Sanshokōjin. In the Shimane gun, Tako ura (bay) section of the 1717 work, 'Unyoshi', there is no mention at all of a shrine named Sanshokōjin. Kanezaki Junpei, who visited the area around the end of the Edo era, noted the shrine there as being called Sanpōkōjin. The second character was written differently from the original name and is translated as 'Three Treasures/Jewels'. This 'Sanpō' originates from 'Buppōsō', Buddhist protection/guardian gods, which in more common, practical life were thought to have been worshipped as Fire, Earth and Water deities. Although Hachimangū, dedicated to Emperor Ōjin, may seem far removed from the original Sansho/Sanpo koujin shrines, in actual fact there is every possibility that they were to be found co-existing quite normally from the times of the Buddhist/Shinto synthesis that occurred during the Edo. This is exemplified by the Sanpōkōjin shrine being enshrined within the shrine grounds of Hachimangū. Furthermore, according to the 1946 publication, 'Izumo-gun (district) Detailed Shrine Accounts', Hachimangū shrine was established here by the ceremonial transfer of a divided tutelary deity by the Tsuwano Domain chief retainer, Tako Geki Saemon. The publication also noted the enshrinement within the shrine precinct of the smaller shrines, Yasaka (deity Susanō- no- mikoto), Ebisu (Kotoshironushi) and Konpira (Ōkuninushi). Could these three shrines be connected to Sanshōkojin? 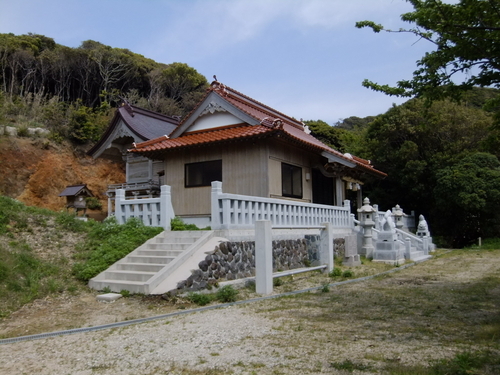 In addition, this Konpira shrine is also known locally as 'Okuninushinokami-aramitama shrine. 'Aramitama' refers to the rough, vicious aspect of the soul of a kami (god) with the character for 'ara' being the same character used in the name kōjin. Susano-o of Yasaka is famous for being a tempestuous violent god, so it is of great interest to see the two kami (gods) connected in this way. Tako Hachimangū is enshrined on top of the mountain to the right side of the harbor. Care is needed if approaching up the many stone steps leading to the shrine, but there is an alternative asphalt-covered road route from the square at the rear of Hachimangū. Hachimangū, which looks out over the Tako waters, is an offertory spot for those following the Shio Kumi faith (the gathering/ dedication of salt water in bamboo pipes which is also performed at the end of a period of mourning). New Year in Tako ura starts with the Miyaneri procession of the Toshitoku sama deity. Next, prayers are offered up asking for large fishing hauls and safety at sea. On January 5th, fishermen gather and make a straw boat, setting it sail out into the Tako bay at nightfall on the 7th. 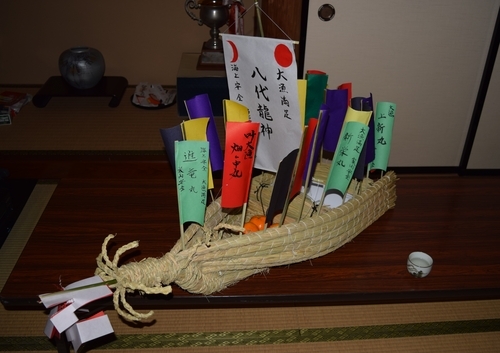 The cargo onboard, five grains, silkworm, cocoons and mica, is likely an offering for the sea god Ryūjin. Heading further north in the area will take you to Marine Park Takobana, a cape resort at 100m above sea level. This area is said to have been used as a lookout by the soldiers garrisoned at Sezaki Fortress-mentioned in the Izumo Fudoki. It offers commanding 270 °views of the silhouette of Oki Island and the Shimane Peninsula stretching out before it. This, coupled with the firelights set up to lure fish at night is a sight that remains in the memory. Also here are sixteen rental cabins (each housing six people) and a campsite. Reservations can be made up to two days before although bookings for July can be taken from January 1st of the same year. It seems that mid-winter is the time to start thinking about your summer plans.